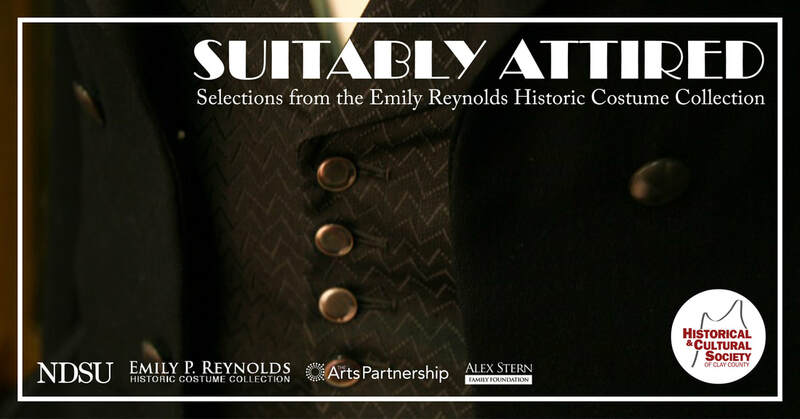 Drawing from the Emily P. Reynolds Historical Costume Collection at North Dakota State University, Suitably Attired explores the history of the suit in America. As clothing is an expression of who we are, or how we choose to present that vision of ourselves to the world, the suit's evolution offers a fascinating perspective on a variety of cultural forces. For example, when boys in the nineteenth and early-twentieth centuries moved from the ubiquitous dress worn by both boys and girls to their first suit, their growth was marked from infancy to a transitional form of masculinity. Similarly, women adopted suits in the twentieth century to reflect their movements from a domestic world in the home to one in which they participated more fully in American business and government, spheres traditionally occupied by men. Likewise, men's suits in the 1960s offered their wearers the first opportunity to express their individuality via color and cut since the Victorian era. Also, join us for a FREE & public opening reception on Tuesday, December 4, from 3:30PM to 7:00PM. Refreshments will be served and guest curator Kim Baird will lead a gallery talk at 3:30PM and 6:00PM.